Jason Cummings after signing for Nottingham Forest. Peterborough United have today (July 13) signed Nottingham Forest striker Jason Cummings on a season-long loan. Cummings (22) moved to the City Ground from Scottish Premier League side Hibs for over a million pounds just over 12 months ago. He scored three goals in his first three Forest games - two in a League Cup tie at Newcastle - but started just seven Championship matches before he was loaned back to Scotland in January where he joined Rangers. He scored six goals for Rangers. Cummings has two full international caps for Scotland, the last against Hungary in March, 2018. 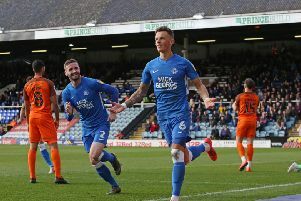 Posh have been seeking two new strikers in the expectation of Jack Marriott leaving the club this summer. Posh had a £1.2 million bid rejected by Hibs for Cummings in August, 2016. Cummings was Hibs’ top scorer over each of the three seasons after making his debut in 2013-14, scoring more than 20 goals each season, making him the first player to achieve this feat for over 50 years. These goals helped Hibs win the Scottish Cup in 2016 and promotion in 2017. Posh boss Steve Evans told www.theposh.com: “I am delighted to sign Jason. When you sign a player of the calibre of Jason from a club the size of Nottingham Forest, you have to give credit and thanks to our chairman Darragh MacAnthony for sanctioning the move. When you take into consideration that we will be paying the full wages for Jason, recognition has to be given to Darragh and the board of directions. Cummings should be involved in tomorrow’s (July 14) friendly at St Neots.